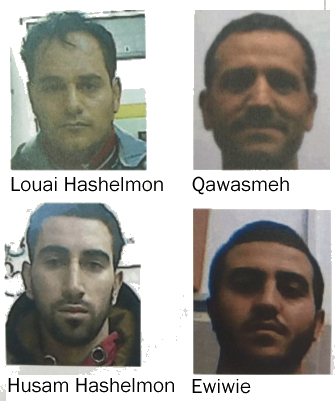 Details were released today of the discovery and capture of a Hebron-area terror squad that sought to carry out one or more Arab-on-Israeli shooting attacks. For that purpose, its members had equipped themselves with lethal equipment including at least one M-16 rifle. A joint Shin Bet-IDF operation brought the cell's activities to an end in November and its members are in custody. The four names publicized today are Mehmed Ali Qawasmeh, 38; Amr Mehmed Ewiwie, 29; Louai Faisal Hashelmon, 32; Husam Fakhri Hashelmon, 24. All are charged with being part of the terror cell and were indicted for conspiracy to commit voluntary manslaughter and for being members of Hamas, an illegal organization. The authorities are not saying whether there are others not yet named, though that is the subject of speculation in the media today. the brother of one of the terrorists responsible for the kidnapping and murder of three Israeli teenagers in summer 2014, the Shin Bet says. And so have numerous other Qawasmehs.